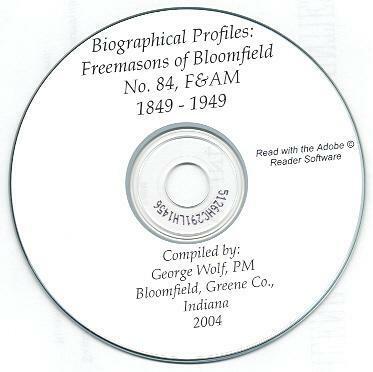 The book, "A record of the Freemasons of Bloomfield Lodge No. 84 (F&AM) of Bloomfield, Greene County, Indiana for 1849 - 1949." This 164-page book was compiled by a Past Master of the Bloomfield Lodge from Lodge archive records, Greene Courthouse records, and the genealogy section of the Greene County Public Library. 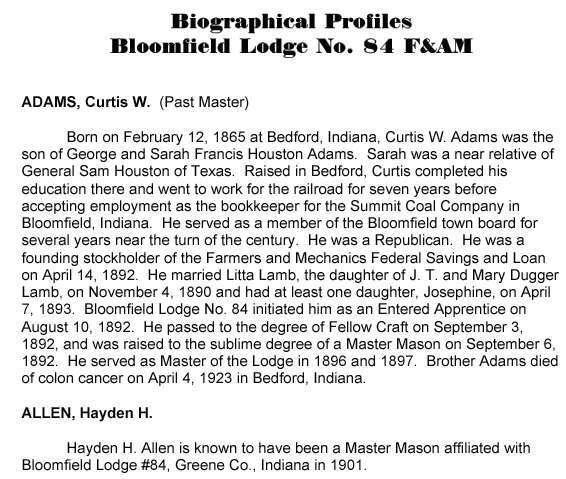 It provides a short biographical sketch for most men who were affiliated with the Bloomfield Masonic Lodge from 1849 to 1949. The Bloomfield Lodge was founded in 1849. In early days most men of good repute belonged to a fraternal organization of one kind or another. This short book focuses on the Freemasons of the Bloomfield area. A number of surrounding Greene County Lodges were formed as offshoots of the Bloomfield Lodge, so many non-Bloomfield residents are represented. Please note: This is not a paper book, it is a scan of the original paper book into the digital Adobe PDF format, written on a CD-ROM. You read this book on your computer using the free Adobe Reader software. It is a digital version of a hard to find book. If you could find a copy of the 1949 printed book, it would be very expensive. Curtis W. Adams, Hayden H. Allen, Henry Notcaugh Allen, John Raleigh Allen, John Bays Allen, Marion Allen, Robert Allen, R. A. Allison, Chris Ammer, Roy Elmer Anderson, Raymond Joel Andrus, Riley Colburn Applegate, Lewis Harper Arthur, George Harvey Asdell, Carter Harrison Ashcraft, Guy Emery Ashbaugh, Joseph Ashbaugh, Raymond Ashbaugh, Charles Delbert Ausman, Homer Frederick Ausman, John Etheridge Ausman, Daniel Marion Axe, Samuel W. Axtel, Roy Bach, Romulus Romeo; Backusto, Cavins Baughman, John Baughman, Earl Baker, Everett William Baker, Ralph Bernard Baker, William M. Baker, Charles A. Ballou, Leland Stanford Barkley, Stanley Mack Barkley, Robert Franklin Barr, Billy Dale Bays, Byrd Bays, Donald Bays, John Franklin Bayse, Jerry Allen Beard, Cornelius (A.K.A. Neal) Benham, Isaac A. Benham, Joel Benhem, Andrew Rockliff Bennie, Leslie Kime Billings, Robert Earl Black, Emerson Dallas Blackmore, James Dawson Blackmore, Marcus Blaker, David Blankenship, Rolin A. Blount, Richard Leon Bock, James Arnold Bogan, Paul Vance Bogard, Ralph Bogard, Thomas Bogard, William Franklin Bogard, William Frederick Bogard, Thomas Dowden Bonuff, Jackie Wayne Boruff, Robert Lee Jr. Boruff, William Francis Bough, William Bovenschen Jr., Don Bowersock, Garrett Warren Bowersock, Henry Bradfield, Frank Clarence Bransteter, Martin Van Buren Bransteter, Henry Warren Branstetter, Oscar Robert Bredeweg, Reuben Brenner (or Brennen), Everett Roscoe Bridges, Earl Brock, Lotus Paul Brock, Charles F. Brown, Clovis Wayne Brown, Roy Millard Brown, Glen Cooke Bryant, Gerald Madison Bucher, Gilbert Jay Buckner, Theodore Buckner, John R. Bufard, Dennis Tribe Bunting, Richard T. Bunnell, Charles Burch, Andrew Burcham, Brantley Burcham, Henry Thomas Burcham, Levi David Burcham, Martin Claude Burcham, William A. Burcham, Wilbur Norman Burgess, Frank Lewis Burke, W. H. Burke, Harold Lloyd Burkhart, Vachel Burns, (or Vachel Burris), John W. Bushman, Thomas Van Buskirk, Daniel Butcher, David Butcher, John R. Buzzard, Richard Douglas Byers, Daniel Gordon Bynum, Orval Edgar Cain, Robert Lowell Cain, Chenault Webb Calldemeir, H. C. Callender, Bert Edward Calvert, James Edwin Campbell, David Canada, James F. Cantwell, Peter Carlson, Forest Darwin Carmichael, Joseph T. Carmichael, Schuyler C. Carmichael, Van Wesley Carnegie, James Edward Carrell, Wendell Carrell, W. W. Carter, Milford Lowell Casner, Zachary Catron, Col. Adin G. Cavins, Benjamin F. Cavins, Col. Elijah Henry Clay Cavins, R. W. Cavins, Samuel R. Cavins, Courtland Matson Chambers, Charles Chaney, Nathan Hale Cherry, Clem S. Christi, John Ross Clark, Robert Floyd Clark, Ulysses S. Clark, Guy D. Clemments, Rev. John Robb Cobb, Rev. Henry C. Cocknum, Roy Coffey, William H. Cole, M. E. Collins, Aaron Arnold Combs, Arnold Hugh Combs, Charles E. Combs, Earl Edington Combs, Gilbert Stanley Combs, John D. Combs, Martin Luther Combs, Owen Quillen Combs, Wendell Edward Combs, Dr. William Mark Combs, William Martin Combs, Jason N. Conley, L. Newton Connell, Herschel William Cook, Rilus Eastman Cook, Dr. Thomas Roy Cook, Warren David Corbin, William Elbert Corwin, William Dale Corwin, Charles Cox, Elza Owen Cox, Frederick W. Cravens, John Alonzo Cravens, James Frank Cravens, Thomas A. Cravens, Dr. William Routt Cravens, James Crawford, Richard A. Crays, Harwood Russell Crites, John Crites, David William Cross, George E. Cross, Robert Alexander Cross, Ira Delton Crossman, Gerald Stanley Croxton, Bert Edward Culvert, Phillip H. Curran, Loren Edward Curtis, John Willis Cushman, Robert Earl Cushman, Alfred Tennyson Custer, Ora Cuthrell, Sylvanus Daniels Jr., Christian Danielson, H. Y. Darnell, Cyrus E. Davis, Frank G. Davis, Donald Wines Dean, Lawrence Edward Deaton, Forrest M. Deck, Wiley O. C. Deck, Lex V. Deckard, Charles Harry Defrees, Arthur Clafering Demaree, Dugger Dennis, Francis Frederick Devilbiss, Onie Ray Dilley, Clifton Elsworth Dixon, Forrest Wayne Dixon, Van Huffman Dixon, Roscoe Farrell Dowden, Rev. Joseph Nathaniel Arthur Downey, Byrd Aden Doyle, Gladis Doyle, Francis M. Dugger, Thomas Homer Dugger Jr., William Edward Duke, William Joseph Duke, Benjamin Franklin East, Hughes East, Elijah Washington Edington, Robert Paul Edington, Bertrum (Bert) Edwards, Donald Wayne Edwards, Earl Edwards, Kenneth Abram Eller, Van Ellett, John Hollen Ellis, Ross Emery, George Edward Endres, I. Lee Endres, George F. English, Rev. Alexander R. Evans, Carl Freeland Eveleigh, Joseph Eveleigh, Robert Edward Eveleigh, William Eveleigh, Thomas L. Fainot, Frederick A. Fainot (Fearnot), James Robert Farthing, Able J. Faucett, Charles Ferguson, Wilbur Dale Ferguson, Cale Feutz, John Feutz, Gerald Ray Fields, Theodore Fields, Carl Edward Figg, Raymond Willis Fisher, Anthony John Fistos, Henry Fitzpatrick, James Wharton Fitzpatrick, Harley E. Flake, Claude Leslie Flater, Clayon Flater, Donald Lee Flater, John Bennett Flater, Col. Morris Eugene Flater, Myers Dewitt Flater, Nicodemus Flater, Russell Flater, Clyde Flory, Jacob Flory, Roy Lee Floyd, Delmar Foddrill, Homer Foddrill, John H. Fodrill, Dr. K. B. Ford, Guy L. Foster, James Foster, Reede B. Foster, Kenneth C. Foulks, Harry Freeland, Joseph Lee Freeland, William Irving Freeland, George E. French, John H. Fritze, Albert Gerald Fry, Bert Fry, Charles J. Fulk, Allen Fuller, Charles Edward Fuller, Russell Fuller, Gayle Russell Gabbert, Otis Ambrose Gadberry, William Wilshire Gainey, Henry Gastineau, Merle Gill, Nathan F. Gill, Glenn Vernon Gladville, Clement Quillen Goad, Earnest Elmer Goodwin, James Lowell Goodwin, William Howard Goodwin, George O. Gorman, John Berry Gorman, Dr. Jerome Alexander Graf, John W. Graham, Louis Samuel Graham, Rex Axtel Graham, Russell Smiley Graham, Dr. Ephram E. Gray, Frederick Wesley Gray, George Manard Gray, Dr. John Wesley Gray, William Gray, Claud E. Gregg, Bernard Greene, W. L. Greene, R. C. Greves, Carl Kenneth Griffith, Ralph Edward Groomer, , John Carl Gussio Jr., Marland Gheen Haines, Lebert Hamilton, Malcom Luther Hamilton, Robert Lee Hamilton, Marcus Benjamin Hamlin, Hobert T. Hancock, John R. Hand, L. H. Hand, Earl Hansford, Forest Leon Hanson, Chester Philip Harrah, Phillip John Harrah, Cread Harris, Ronald M. Harris, Albert Douglas Harshman, Russell Ray Harshman, James Hart, Paul A. Harting, Wilbur Floyd Hartling, H. S. Hartsell, James Hasler, James Olaf Hasler, Daniel B. Hatfield, Earl Hattabaugh, Charles Milton Hawkins, Harold Arthur Hayes, Delbert Lloyd Haywood, Henry Haywood, James William Haywood, John Haywood, Samuel B. Haywood, Samuel Charles Haywood, Aaron Benton Heaton, Alvin Merl Heaton, George Bogard Heaton, Henry Harrison Heaton, Henry Melvill Heaton, John Brantley Heaton, Orlando Sheridan Heaton, Ward Thomas Heaton, Oscar M. Heldt, Charles E. Henderson, Charles R. Henderson, Cleophas Franklin Henderson, L. C. Henderson, Allen Theodore Hendren, Curtis Cassius Hendren, Gilbert Hadley Hendren Jr., Robert D. Hendren, Oscar Herman Hendren, William Foster Hendren, William Ora Henry, James G. Hert, Earl Arthur Hicks, Henry H. Hill, John L. Hill, William Dewey Hill, Frank (Francis) M. Hindman, L. C. Hindman, Eli Hollars, James Hollers, Joe William Hollars, William C. Hollars, Robert Russell Holmes, Russell Lowell Holt, Fred Landis Holtsclaw, Russell Therold Hord, Edward S. Horn, James Alba Hornbaker, Earl Housford, Alvin Delbert Hudson, Wendell Lee Hudson, Earl Huffman, Jason Huffman, John C. Huffman, John Richard Huffman, Olas Leon Huffman, Richard Huffman Jr., Edgar Humbarger, Andrew Humphreys, John Osborn Humphreys, Guy H. Humphreys, Kiak O. Hunt, Dally Hunter, Daniel Hunter, Guy Hunter, John P (or W). Hunter, Isaac Inman, Henry Irons, John Henry Irons, Dr. Harry Randolph Isenhower, John R. Isenhower, William L. Isenhower, Orin Chester Isenogle, Royal Van Isenogle, William Cyrus Isenogle, Claude Wendell Jackson, Earl Jackson, Evan J. Jackson, George Earl Jackson, John Albert Jackson, Thomas Franklin Jackson, Lloyd Osborn James, Delbert Warren Jarman, George Otis Jean, James Thomas Jenkins, Rex Jenkins, Ward Jenkins, Leroy Jensen, Levi Johnson, David O. Johnson, James Ray Johnson, John H. Johnson, Morton Virgil Johnson, Orda Wayne Johnson, Stanley Livingston Johnson, William H. Johnson, Charles Jay Jones, Jefferson Thomas Jones, Lee Henry Jones, Lewis Henry Jones, Millard Jones, Solomon M. Jones, W. A. Jones, William G. Jones, William Kent, John F. Keplinger, Clifton P. Kessler, Paul Kessler, George Kinman, Elmer Kirtley Kirby, Samuel L. Kirk, John H. Knapp, William Britton Knipe, Theodore Henry Knobloch, William M. Knop, Horace Cyrus Knox, Robert Franklin Knox, Rev. Joseph John Koble, Dr. John Kutch, Lyle Leovern Lambeth, Charles Wesley Laughlin, Ira Tecumseh Laughlin, John Harry Laughlin, Laverne Leavitt Laughlin, Oscar Rufus Laughlin, James Law, Adere G. Leavins, Herbert Douglas Leavitt, John Wesley Lehman, Renos Keene Lehman, Simon Lehman, Charles Curtis Lester, Charles Seymour Lester, Thomas Isenhower Lester, Reed Alexander Letsinger, Emory Otis Lewis, Stephen H. Lockwood, Thomas Loder, Daniel Boone (or Bynum) Long, Edwin Beno Long, Lester Long, Caleb M. Lowder, Dr. Howard R. Lowder, Kenneth Lee Lucas, Raymond Thomas Lucas, Emory W. Luccock, Marion Lynn, William Jean Lynn, Joseph Lyons, Matthew J. Lyons, J. P. Madden, Paul Lamb Maddock, William Brundedt Maddock, Rex Calvin Mallette, Charles Mansfield, Lester Mansfield, William Henry Mansfield, Rev. Leon P. Marshall, Walker Robert Marshall, Bryan Gerald Martin, Rev. S. J. Martin, Frank Lester Martindale, Frederick Mason Martindale, Hugh Martindale, Tyler A. Martindale, Dr. Elias Ranard Mason, William Mason, William Vade Mason, M. H. Mayhood, William Robert Mccoskey, Loren Everett Mcdonald, Frank Spellman Mcgannon, Earl Mcintyre, Jack Wayde Mcintyre, Teddy Morris Mcintyre, Albert William Mclaughlin, Heston L. Mclaughlin, John Ebenezer Mclaughlin, Robert Enoch Mclaughlin, S. W. Mcnaughton, Richard Mcneal, Marion A. Menges, Theodore Menges, William A. Meredith, Ernest Blaine Merritt, Angus Inman Messick, Carl Aden Messick, Frank Vernace Miller, Henry Marshall Miller, Jacob Miller, Oliver Philip Miller, Rex Velner Miller, David Wayne Miles, Stephen D. Miles, Mell Mitchell, Dink Herbert Moffett, Frank Moffett Jr., Robert Quince Moffett, Webster Vorhees Moffett, William W. Moffett, John Osborne Moomaw, Alvin Ray Moore, Herschel W. Moore, John Hall Moore, Theodore Moore, Wayne Moore, John S. Morgan, Thomas Henby Morgan Jr., Eddie Junior Morris, Lemuel Edward Morris, Jepitha Moss, William M. Moss, Dr. Mathias Samuel Mount, Homer Daniel Mowery, M. H. Myer, George Francis Myers, William Thomas Myers, William H. Myers, Davie Lee Nation, Olaf Clyde Naugle, Elmer E. Neal, Henry T. Neal, Amos D. Neidigh, Murray Nesbitt, Burgess Kiah Noel, Rex Julius Noel, Nicholas Nolan, Dr. Horace V. Norvell, Fred Courtney Ockerman, Max Wade Ockerman, Norvell Ockerman, Andrew (Andy) J. O'donald, John S. O'donald, Raymond William O'laughlin, Claude Oliphant, Joseph T. Oliphant, Paul Lester Oliphant, Henry Oliver, George Anton Olsen, John Junior Ooley, Kenneth Richard Ort, Gary Guy Osbon, Capt. George W. Osbon, Maynard Osborn, Alfred Roy Osburn, Alexander G. Owen, Henry C. Owen, Aurther Palmer, Charles Channing Parker, Lowell Francis Parker, Alvin Clyde Parsons, Robert Franklin Parsons, Allen Gaines Pate, James Baxter Pate, John A. Pate, Lawrence Tracy Pate, Minor Frank Pate, Douglas Payne, Silas D. Pendly, James Wallace Pendry, James H. Persons, Alfred Peterson, Malcom Marion Porter, Denzil Milroy Price, Lowell W. Pruett, Earl Quillen, Emmett A. Quillen, Homer Charley Radcliff, Jacob Waldemar Radcliff, Frederick Royce Radebaugh, Thomas Rader, Franklin Ramsey, Henry Ramacher, Thomas Bertram Rankin, Charles Marshall Rector, Jesse Rector, William Lester Reed, Roscoe Rutledge Rees, Richard Lee Reister, William Richard Resler, Samuel C. Richards, Kenneth Eugene Richardson, Logan Maynard Richeson, Richard Marvin Richeson, Earl Elmer Richmond, Seymour Riddle, Morris William Ritter, Ivan Luther Roach, Alvin William Roberts, Rev. Luther Denzil Robertson, John C. Robinson, George Rollison, John Thomas Rollison, Lloyd Rollison, William Dewey Rollison, Elihu E. Rose, William K. Routt, Warren Richardson Rowe, A. C. Rudisell (or Rudisol), Hosea Reed Russell, Frank Morris Ryan, Louis P. Ryan, Emery Sargent, William Grant Schrantz, Maj. Robert Woodrow Scott, William Franklin Seals, George Wayne Secrest, Guy Ronald Secrest, Kenneth Joseph Secrest, Adolph Louis Seipel, Clifford Cecil Selby, Joseph James Sexson, Rev. William Mark Sexson, Thomas Sharples, William H. Shatser, Lucien Shaw, Clifford Ray Shepherd, Delbert Shepherd, Dencil Shepherd, Newton Emery Shepherd, Walter Winfield Shertzer, William H. Shertzer, William Rubright Shertzer, Benjamin F. S. Sherwood, Elmer William Sherwood, Frank W. Shryer, George E. (or C) Shryer, G. William Shryer, Marcus H. Shryer, Oscar W. Shryer, Joseph M. Shute, Rex Sims, Donald Max Simmons, Floyd Elbert Sipes, Lanis Edward Sipes, Cyrus Lee Slinkard, Henry S. Slinkard, Theodore Ellis Slinkard, William Lycurgus Slinkard, Bobbie Ray Smith, Elijah Smith, John T. Smith, Martin Van Buren Smith, Willard Smith, William G. Smith, William C. Smydth, David Soames, Dale Wilson Southern, David Riley Spainhower, Albert Lowell Sparks, Bernard Wade Sparks, Dorris Sparks, Hurley Estel Sparks, James Borter Sparks, Clarence Spears, Rev. J. A. Spencer, Ned Spinks, Thomas Edward Spong, Albert Jesse Squires, Albert Lee Stafford, Charles Grant Stalcup, John Bradford Stalcup, Stephen Stalcup, Walter Elsworth Steele, Edward Henry Stein, Charles Ray Stevens, Jesse Thomas Stevens, Robert Louis Stevenson, Delno D. Steward, Ralph Walker Stewart, George P. Stone, Joseph W. Stone, Robert Paul Stone, Israel Stough, Delmar Ancel Strauser, Marvin Bernard Strickland, Albert Oather Strickler, Charles Everett Jr. Stringfellow, Ralph Eugene Stringfellow, Edwin R. Stropes, Jeremiah (Jerry) L. Stropes, John B. Stropes, William P. Stropes, Virgil Ray Strosnider, Isaac Stultz (or Stults), Lewis Cass Tate, George D. Templeton, Mark Templeton, William W. Templeton, James Leslie Terrell, Paul Leslie Terrell, Samuel Austin Terrell, William Frank Terrell, J. S. Thompson, R. T. Thompson, Russell Wayne Thompson, Thomas Ralph Titus, Frank Todd, John Herbert Todd, Aden Cavins Torr, Francis Irving Trimmer, Calvin James Tungate, Dr. Harold Burgess Turner, Jack J. Turner, George Upfold, Jonas Uland, Robb Uland, Thomas Van Buskirk, Cyril John Vanmeter, Edmund Baker Vanmeter, Flemen R. Vanmeter, William Vanmeter, F. W. Vansant, Dr. Frank Arthur Vansandt, Henry Vanslyke, Samuel Veach, Frank Rogers Vest, Jack Richard Vest, Parmer Vest, William Robert Vosloh, Charles P. Walker, Ira I. Walker, Joseph E. Walton, Claude Robert Warnick, John Anderson Watkins, Elsworth (Elza) Watson, George Junior Wegner, Dr. Charles Elmer Welch, Dr. Charles Haig Welch, Lowell Baxter Welch, W. C. Welch, Dr. William Henry Harrison Welch, William H. Westfall, David Stanton Whitaker, Samuel Whitaker, Floyd George White, Harris Edmond Wilken (or Wilkir), Allen Williams, Anthony Williams, Byron Williams, Charles Eugene Williams, James Ross Williams, James Ross Williams Jr., Thomas R. Williams, Jacob Lemuel Wilson, Edward H. Wilson, Capt. Marvin Clarence Wilson, William Wines, Emory Harold Wires, John W. Wolford, Barton Enos Wonder, Leonard Dennis Wood, H. H. Woodswall, Thaddeus H. Woodward, Thomas J. Woodward, William Jack Woodward, Andrew Jackson Workman, Bernard David Workman, Bernard Floyd Workman, Claud Phipps Workman, Dale Edward Workman, Donald Franklin Workman, Henry Workman, James Dexter Workman, John Workman, John Frederick Workman, Robert Claud Workman, Roy Workman, Frederick Wright, Joseph P. Wright, Maurice Lee Wright, Virgil Wright, William Benton Wright, William Lee Wright, Walter Ray Wymer, Joseph William Yakey, Allen Elmer York, Paul Maries York, Harry Sylvester Young. The book has 164 pages with a linked 10-page index. 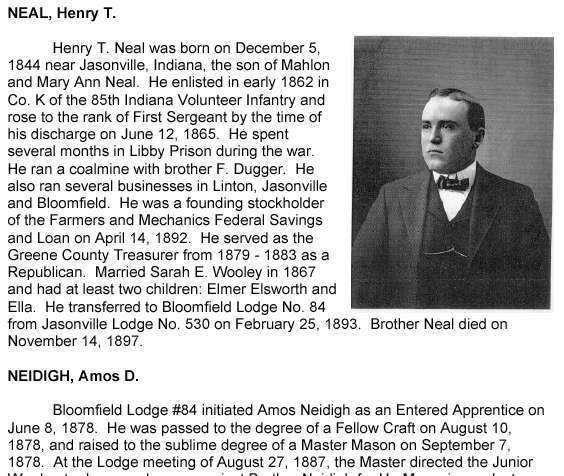 There are large entries for some men - short entries for others - each entry usually provides the Masonic history of the individual and other biographical data such as date of birth, family, parents, etc. if available (please see the sample image). Please note: This is a digital book in Adobe PDF format and written on a CD-ROM.